Hey guys. 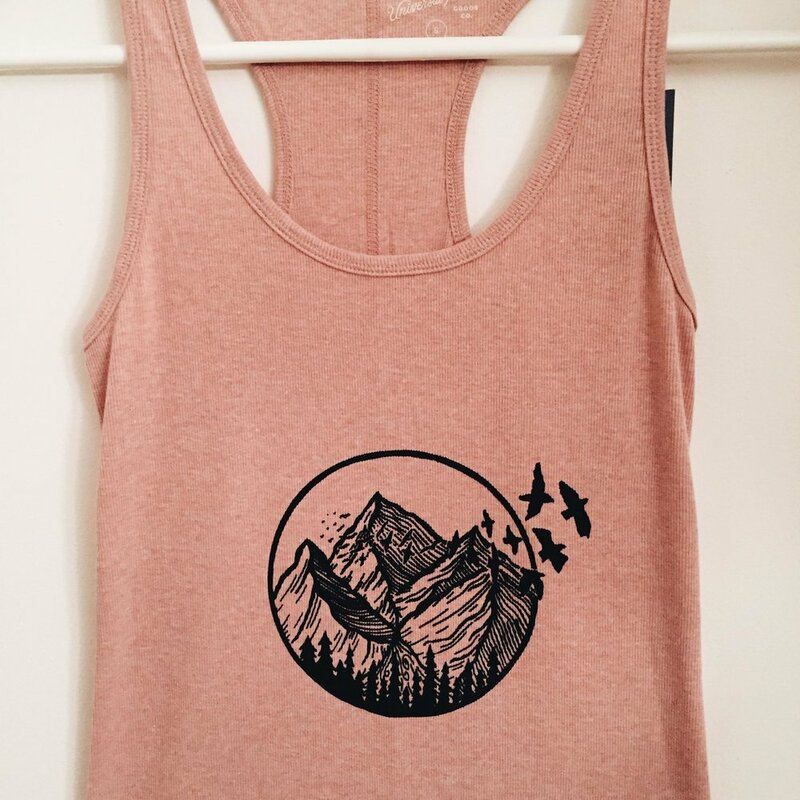 I decided I would do a blog about my screen printing process because while I was doing research I was very confused, there were a lot of different forums and blogs telling me different things. I’m going to tell you what worked for me. This is an at home printing blog — using my downstairs cubby, paint cans to hold up my light, and a sheet of glass from an old photo frame. I have no equipment so this was created on a budget. I bought a screen printing kit at Pat Catans. Find a similar one here. This included a wood frame & mesh, squeegee, red, black, and blue fabric ink, photo emulsion, and sensitizer. There were a couple other things that I didn’t use. I then went to Lowe’s and bought a 500W light. I was most confused on this part, but this light worked for me. Let me know if you have any other suggestions on this one! Then I headed to Office Max to print my art transparencies. You can do this at home if you have a printer that allows it. I printed 2 identical transparencies. The first thing I did was put on gloves. I filled the sensitizer bottle halfway with cold water, mixed it, and added that to the bottle of photo emulsion. The emulsion should turn from blue to green. Make sure it is mixed well. The bottles should have instructions. Pour the emulsion onto your screen. You really don’t need much for this part — I think I went overboard. Create an even layer on both sides using your squeegee. Dry the screen in a dark room right after step 2. I used a fan to speed up the process. You don’t want to over expose your screen. The emulsion hardens when exposed to light. I left mine in the dark for about an hour & half. I would set up the next step before bringing your screen into the light. I placed my black poster board on the floor — this is used as a non-reflective material under the screen. I then placed my light 12-15 inches above where my screen would lay. I taped my 2 identical art transparencies together — using 2 created a more rich black image. Once my screen was dry I brought it out of the dark room and quickly placed it on the black board with the flat side facing me. This is the side you will place onto your shirt to print. I then taped my art onto the screen (mirror the image you’re using) and placed a sheet of glass on top — this makes sure that the art hits the screen. I turned on the light for 8 minutes. I then slowly lifted the art to see if it was working. The unhardened emulsion, my artwork, had burned into the screen. This should create a yellowish green color. This is an indicator that you’re ready for the next step. The next step is to wash out the unexposed emulsion, creating your art stencil. You can do this in a shower, sink, etc. Just make sure you have a good amount of water pressure. I didn’t even have to touch my screen. The water should wash off the emulsion and your screen should be clear where your image is. I let my screen dry for half an hour after washing. Once it’s dry you’re ready to print. I used blue painters tape to cover the sides of my screen. This avoids any ink getting past the emulsion. Place a book/cardboard inside your shirt to make sure it is flat. You can do whatever feels right for you. I then placed the screen where I wanted the art to be printed. Place a thick bead of black ink beside your image and use 2 hands to pull the squeegee across with even weight. it works best if you have a partner to hold the screen for you. Then pull the squeegee and ink back to where you started. This makes sure that the ink hits everything. Carefully lift up the screen and you should see your art! Wash the ink off your screen before it dries. You can either place your shirt in the dryer after the ink has dried or use an iron (with paper in between ink & iron) to set the ink. 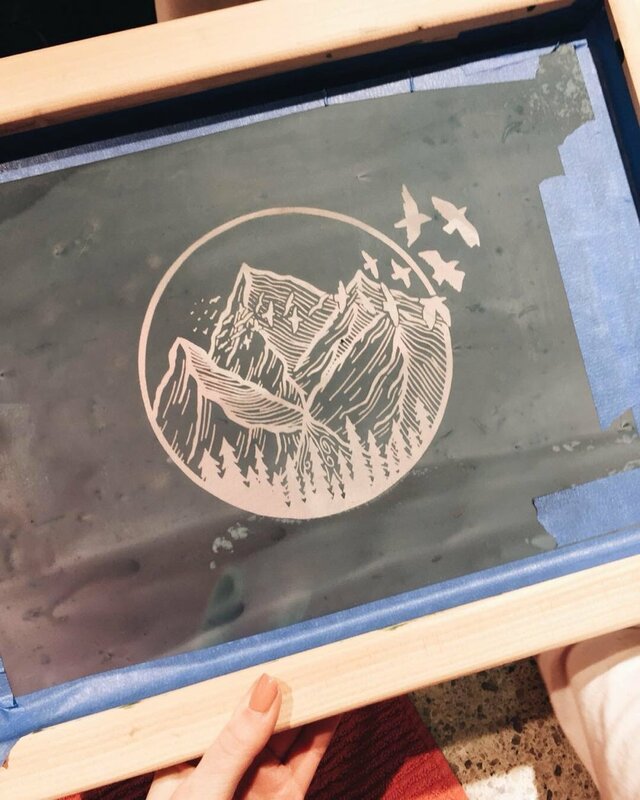 Congrats — you’ve screen printed!